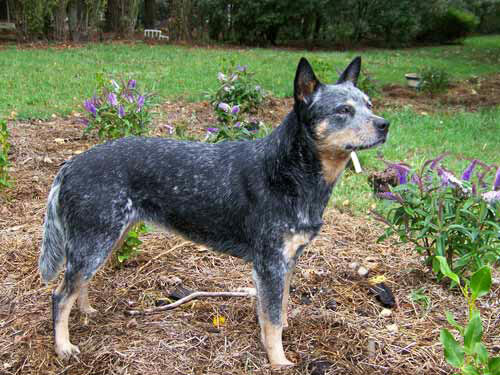 The Australian Cattle Dog has a very strong, intelligent, and independent temperament. It tends to be very tenacious at times and very energetic as well. It rarely gets tired which is why it is recommended for active families. This breed constantly needs to be entertained or to have a task at hand. If it does not, it can become quite disruptive. If it has no productive place to outlet its energy, it will become destructive to its surroundings, which many call 'misbehaving.' If a family has young, active kids, this may certainly be the breed for you. It will give your kid's and your dog's energy a positive outlet. It tends to be constantly on the hunt for adventure. Despite its need for activity, it is an extremely well-behaved dog once trained. The upkeep of this breed can be quite tiresome for the owner due to the dog's extremely enthusiastic and energetic personality. It needs tons of physical exercise and just about the same amount of mental exercise as well. This is not a 'walk in the park' type of dog. It needs exercise where lots of energy is exerted. This breed was a great herder in its day because it was very focused on the task. If given a task, this dog will succeed. Its coat it shorter so it only requires brushing every week or so. The health of the Australian Cattle dog does need to be watched by the owner. Different things tend to surround this breed and it is important to take your dog to the vet any time that you spot something is off or could be wrong with its health. Major health concerns include Chronic Hip Dysplasia, OCD, deafness, PRA elbow Dysplasia. Chronic hip Dysplasia and elbow Dysplasia really need to be watched for, as they could inhibit the dog's quality of life by a huge amount. Deafness and OCD are also inhibiting, but the dog will not feel the physical effects of those types of diseases. As for minor concerns, there are not many. This dog's health concerns tend to be pretty major or non-existent. Of course, you will see the occasional cataract and/or lens luxation, but those tend to come with age. PPM and vWD are also seem occasionally but are nothing to really be concerned about on an every day basis. It is suggested to test your pooch on a regular basis through your vet. They will perform a series of hip, hearing, eye and elbow tests on your dog. Throughout history, this breed has been known for grazing cattle. A dog with stamina was needed to be able to drive the cattle through the long distances of the rough terrain with a suitable willpower to avoid barking. In 1840, Hall bred this breed to produce the white blaze found on the breed's head. Over the years, the dog has been bred with numerous breeds and was definitely endowed with the herding instincts that is seen today. The dog was not immediately popular when it came to America, however, it gained popularity over time.